This is a great strategy game in which you will get the chance of creating your own flag, that your troops will wear in combat. You must have a great leader personality to command all your troops to victory. Have fun creating camps all around the territory and increasing your resources, so you can build more buildings to recruit more combatants. 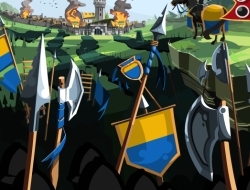 Have your armies fight wars with other players so you can take over all their territories and become the greatest ruler of the world. Trade goods to earn gold and make sure you guard your villages well or else maybe they will get ambushed by your opposing conquerors. Goodgame Empire 10.00 between 0 and 10 based on 1 votes.